You may wish to read an introduction to this section or a page on Roman and Medieval Trieste first. In 1379-82 Trieste was affected by the effects of the War of Chioggia between Venice and Genoa and by a dispute in the Patriarchate of Aquileia to which the town belonged. In September 1382 the citizens of Trieste requested the protection of the Dukes of Austria, who sent troops and appointed a capitano who ruled the town with the assistance of representatives of the wealthiest families. In 1470 Frederic III, Duke of Austria and Holy Roman Emperor, ordered the construction of a fortress which was strengthened in the following century. 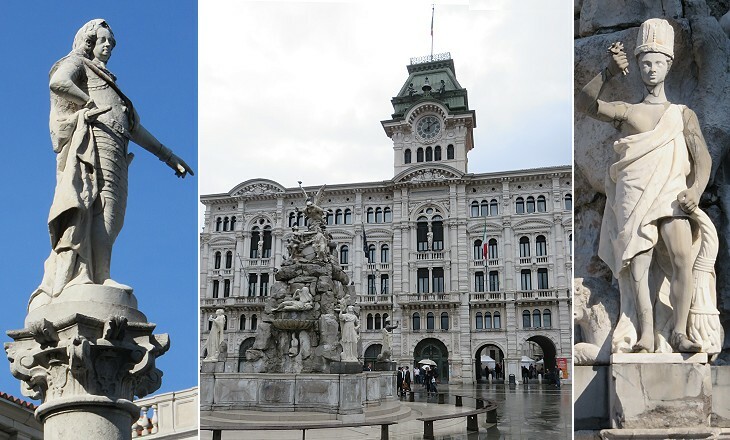 The history of Trieste records several instances of wars/conflicts with Venice. In 1463 the Venetians blockaded Trieste and the town had to accept major limits on its trading. In 1508, during the War against the League of Cambrai, the Venetians occupied Trieste for a few months. 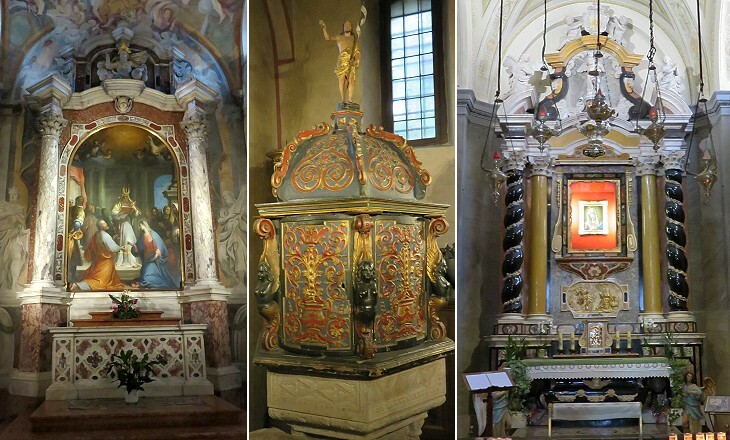 Notwithstanding these recurring conflicts and the trade rivalry S. Giusto and other churches were decorated with works of art made in Venice or based on Venetian patterns. The Frangipane were one of the most important Roman families in the XIIth century, but in the XVIth century their influence on Roman matters had greatly declined. Some of them chose to fight for France, Spain or Austria and in 1600 Lello Frangipane died during the Long Turkish War (1593-1606) between Austria and the Ottomans (you may wish to see his bust by Alessandro Algardi). 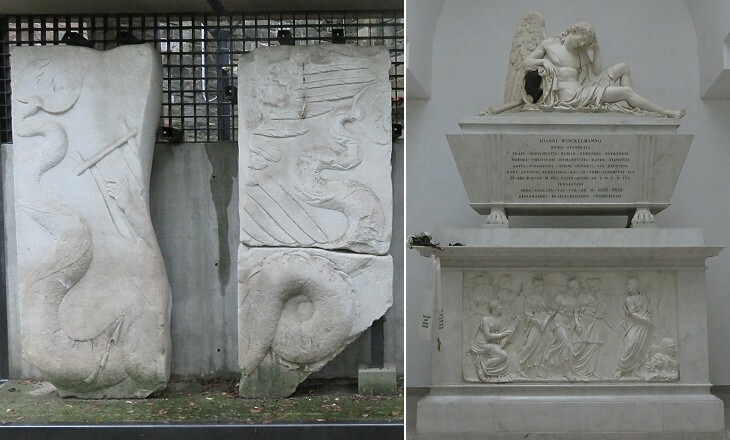 The Marenzi were a family from Milan and their coat of arms includes a biscione (grass snake), a heraldic symbol of the Visconti, rulers of Milan in 1277-1447. The Marenzi who settled at Trieste became part of the Austrian aristocracy in 1654. Franz Anton Marenzi was a general who fought in the Imperial Army during the First and Second Italian Independence Wars. 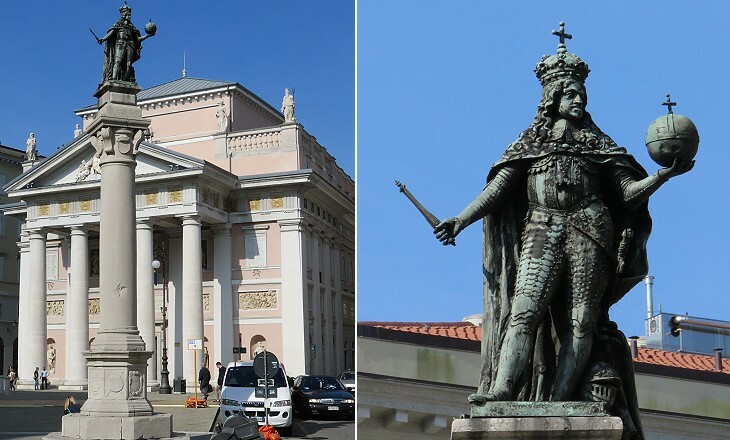 In 1660 Holy Roman Emperor Leopold I, at the beginning of his long reign (1658-1705) during which he faced the Ottoman Siege of Vienna, visited Trieste. Local authorities erected a column to celebrate the event in a square near the harbour. It was moved to its present location in the early XIXth century. 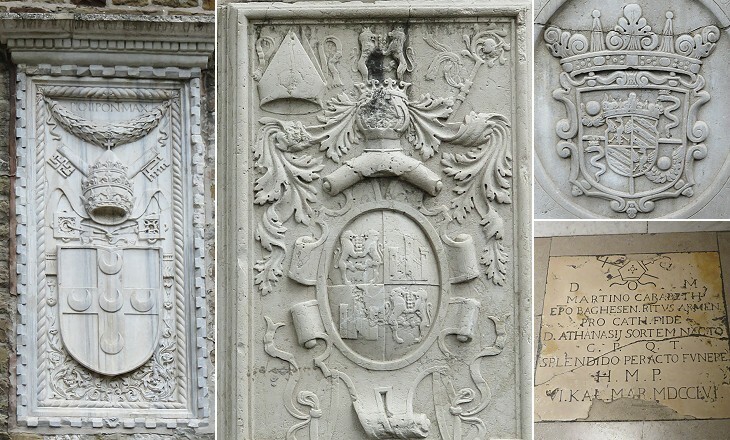 It recalls the Venetian ones at St. Mark's Square and in towns belonging to the Republic (e.g. Chioggia). The economic development of Trieste was hindered for centuries by the Venetian pressures on the Austrian Emperors aimed at limiting its trade. In 1718 however the Austrian Empire was strengthened by the outcome of a war against the Ottomans which instead had been very unsatisfactory for the Venetians who managed to retain Corfu, but lost all their territories in mainland Greece. In 1719 Emperor Charles VI, who in 1713 had become King of Naples, decided that Austria needed to become a Mediterranean sea power. He granted Trieste the status of porto franco (free port) which meant exemption of duties and a general relaxation in laws in order to attract foreign merchants. The urban development of Trieste was favoured by Empress Maria Theresa, daughter of Charles VI, and a neighbourhood of the town is still known as Borgo Teresiano. 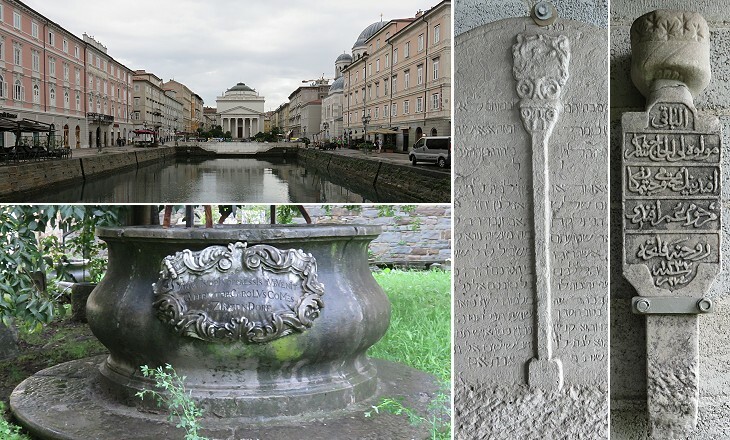 A fountain celebrating the trade of Trieste with the Four Continents was built in 1751-54, perhaps for a visit of the Empress which did not occur. At the end of the XVIIIth century Trieste was a very different town from that at the beginning of the same century. 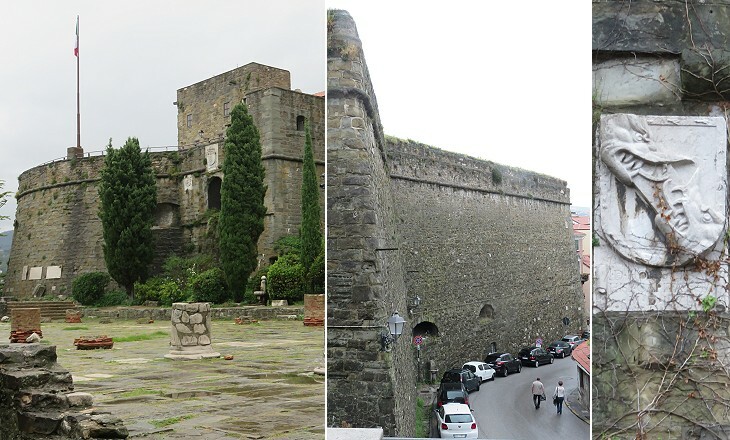 Empress Maria Theresa ordered the destruction of the walls which separated the medieval town from the harbour. She issued an "Edict of Tolerance" giving equal rights to the inhabitants of Trieste, irrespective of religion. She founded schools, special tribunals dealing with commercial matters and insurance companies. During the XVIIIth century the wealthiest citizens of Trieste joined Accademia degli Arcadi Romano-Sonziaci, a branch of the Roman academy by the same name (Sonziaci is a reference to the River Isonzo which empties into the Adriatic Sea a few miles north of Trieste). 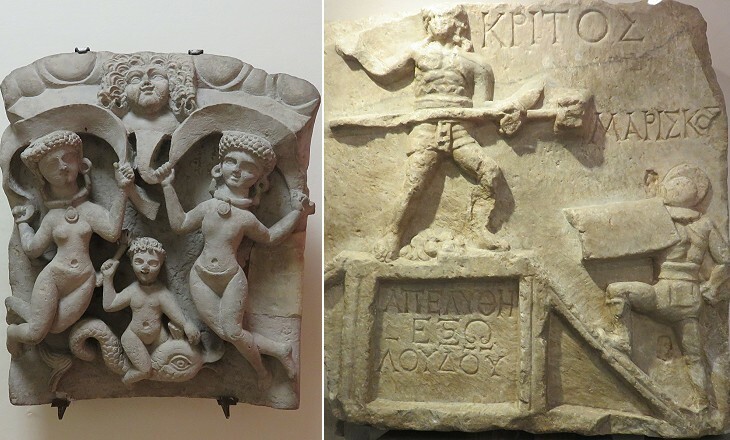 Some of them travelled to Mediterranean countries and were able to collect ancient works of art which eventually were donated to the City of Trieste. In 1809, during the French annexation of Trieste, the academy was dissolved, but it was soon replaced by Società di Minerva, an association having the same purpose (it still exists - it opens in another page). Domenico Rossetti, its founder, decided that Trieste ought to build a monument to Johann Joachim Winckelmann, the author of The History of Ancient Art and the "father" of Neoclassicism. In 1768 Winckelmann was received by Empress Maria Theresa in Vienna. On his way back to Rome, where he assisted Cardinal Alesandro Albani in arranging his collection of antiquities, he stopped at Trieste where he was robbed and killed at an inn. 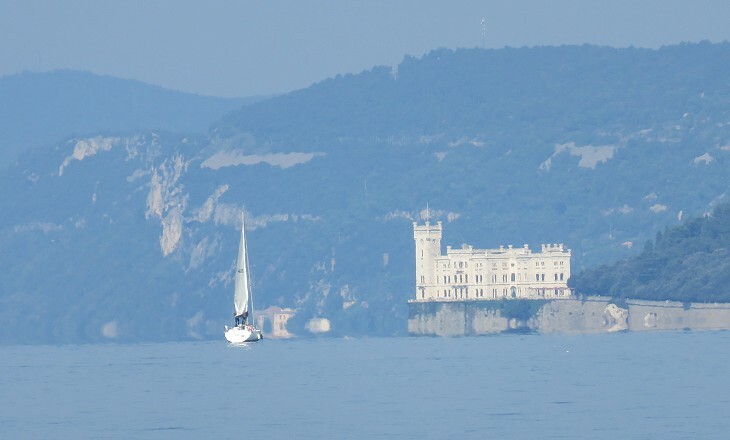 In 1854 Ferdinand Maximilian Joseph, younger brother of Emperor Franz Joseph I, was appointed commander of the Imperial Navy and he came to Trieste where he enlarged the military harbour. He eventually decided to make Pola the main base of the fleet, but he continued to live in Trieste in a small castle by the sea. In this building in October 1863 he met a delegation of Mexican politicians who offered him the crown of their nation. In April 1864 he quit Trieste for Mexico where in 1867 he was shot after a short reign. Today the castle is open to the public and it houses a small historical museum (it opens in another page). In the second half of the XIXth century the historical harbour was moved to another location, thus allowing the main square of the town to be enlarged and redesigned. The imposing buildings that surround it housed shipping and insurance companies, banks and luxury hotels and restaurants. They are testimony to the wealth of Trieste which in 1910 had a population of over 220,000. In 1918 the collapse of the Austro-Hungarian Empire deprived Trieste of its traditional hinterland. In addition the Italian Fascist government implemented policies which led members of non-Italian speaking communities to leave the town. 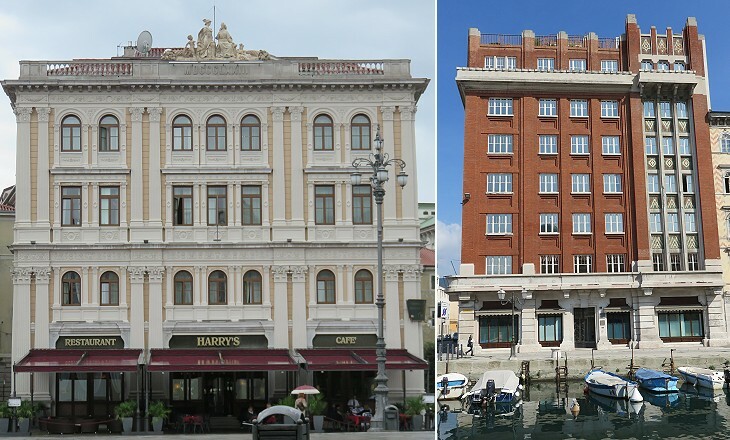 Palazzo Aedes is one of the few interesting XXth century buildings of Trieste. It was designed by Arduino Berlan, son and grandson of local architects. 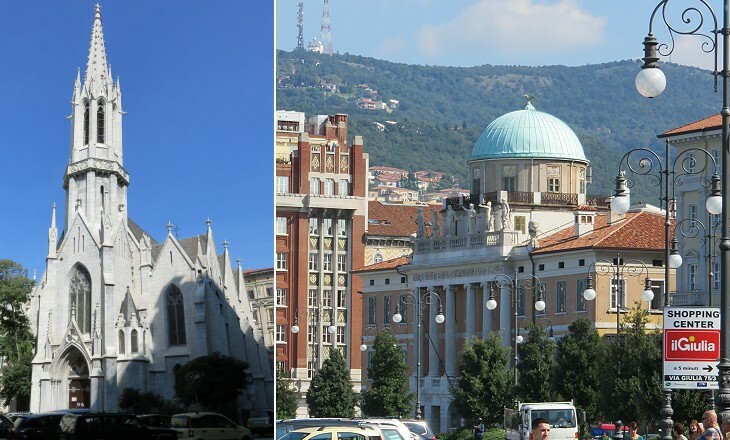 It should have been the skyscraper of Trieste, but municipal authorities denied permission to build to a height above 50 meters. Yet it recalls some brick skyscrapers in New York or Chicago. Sir Winston Churchill - Speech delivered at Fulton, Missouri on March 5, 1946. At that time Trieste was temporarily occupied by the Allies, while Yugoslav troops controlled its immediate outskirts. In 1947 the Free Territory of Trieste was established with British/American (in Trieste) and Yugoslavian (in its outskirts) administrations. In 1954 Trieste was returned to Italy whereas its outskirts were assigned to Yugoslavia. It was not until 1975 that a formal peace treaty was signed at Osimo between Italy and Yugoslavia to ratify the border between the two countries. Trieste was linked to Italy only by a narrow strip of land along the coast. 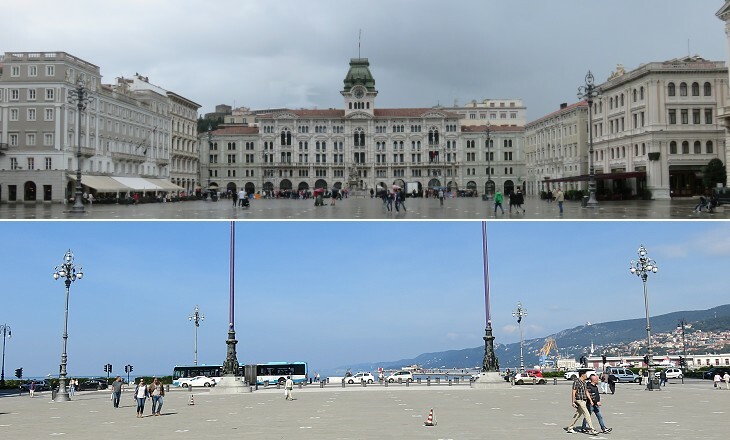 In December 2007, the everyday life of the inhabitants of Trieste greatly changed with the implementation of the European Schengen Agreement which have abolished border controls between Italy and the Republic of Slovenia, a former federal state of Yugoslavia. The two countries share the same currency (euro). 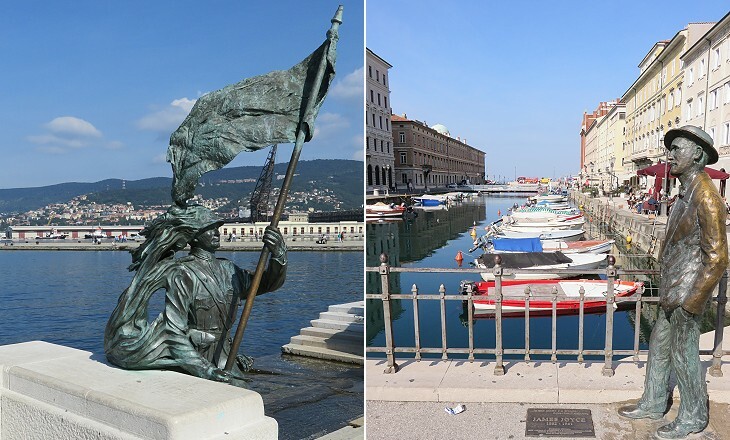 Notwithstanding its dramatic past, Trieste retains a rather cosmopolitan appearance and population.